Blue heat lamp signed by Adam Ruiz Dimensions: 75 x 15 x 15 cm Materials: Sculpted steel, Carrara marble Hand scultped, signed and numbered. The heating blue is how we call this unique color gradient that we apply on the metal thanks to the heat of the famme. Starting from the orangey yellow passing through the purple and shades of blue, here is how this gradient takes shape. Tinting thanks to the famme of torch, are the passages of the hand of the man with this tool, which allows the metal when it rises in temperature to take these soft and subtle colors. The marble plaque in frontage is used as par-light. This material with delicate veins and nuances revealed once the lamp is lit thanks to the light source. Adam Ruiz With a background in Product design and his enthusiasm for metal, a simple but demanding material, Adam studied metal arts and crafts at the ENSAAMA Olivier de Serres. Thanks to these skills, he expresses his passion for design and makes by hand every objects he presents, from the original IDEA to the fabrication. His items reflect his strong attachment to hand work and craftsmanship, which is illustrated by his constant willingness to establish a dialogue between the fabrication process, and a minimal and contemporary aestheticism. You’ll find his hallmark, the three letters ARZ, minted on each of his pieces. 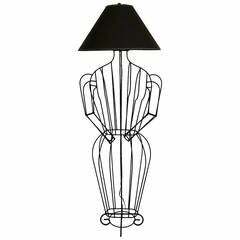 Female form sculptural floor lamp or large table lamp by John Risley.